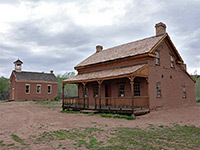 Southwest ghost towns tend to range in character and authenticity from the complete but restored and overtly commercialized such as Calico, along I-15 near Barstow in California, to genuine, neglected sites that have very little of the original settlement remaining, for instance Old Irontown near Cedar City in Utah. 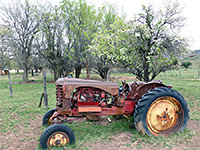 Grafton is somewhere in between; a small group of aged wooded buildings in good condition stands in tree-lined fields near the Virgin River just south of the boundary of Zion National Park, while nearby is a well-preserved cemetery containing a number of graves dating from the 1860s. Grafton was established in 1859 by a small group of settlers from Virgin, 7 miles west, on the fertile Virgin River floodplain, and while the occupancy declined after 1907 when some people departed for the larger, more accessible settlement of Rockville, the last inhabitants did not leave until 1944. The original residents grew cotton, wheat and alfalfa, though despite the good soils and the scenic surroundings, life here was difficult, due to floods, attacks by Indians, and the sometimes harsh winter weather. 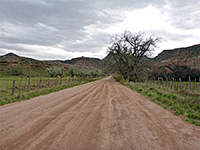 The town is only a quarter of a mile from the main highway to Zion National Park, but is relatively little visited since it lies on the opposite side of the river, reached by a 3.5 mile road (unpaved for the last 2 miles), which is not so well signposted. Five large structures remain, out of the original total of over 30, and all have been carefully restored following the 1997 creation of the Grafton Heritage Partnership, who manage the site. 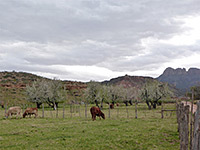 The surrounding farmland and orchards are still used, associated with a nearby ranch; a few people continue to live in other houses in the neighborhood, and some parts of the former village are fenced off, yet the site is still quite atmospheric and authentic, with peaceful surroundings, enhanced by the high, colorful cliffs of the national park that provide a dramatic backdrop to the north. 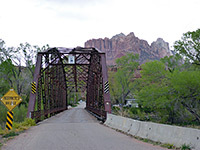 Grafton is reached from the sleepy town of Rockville along Hwy 9; initially south on a residential street (Bridge Lane) that crosses the Virgin River on a historic, single-track iron bridge (constructed in 1924), and then west, along the base of the low, red cliffs of Moenkopi sandstone that separate the lush river valley from the arid rocky land beyond. After 1.5 miles the main route curves back south, climbs into the hills and becomes the Smithsonian Butte Road, a 9-mile scenic backway through a land of colorful mesas and canyons that eventually meets Hwy 59 and so provides a useful short-cut between Zion National Park and the Arizona Strip, as well as offering access to some good free campsites, though a recent change in regulations prohibits camping within half a mile of the highway. At the point where Bridge Lane bends south, a lesser, unpaved road continues roughly parallel with the river for another 2 miles to the ghost town. The first point of interest is the old cemetery, which contains a few dozen graves from the period 1860 - 1910, with telling inscriptions that give some insight into the harsh life at that time, such as the three Berry brothers (and one wife), all killed by Indians on April 2nd 1866, or the five children of John and Charlotte Ballard, all of whom died young between 1865 and 1877, none living for more than 9 years. The Ballard parents are also interred, living until 1891 and 1901 respectively. 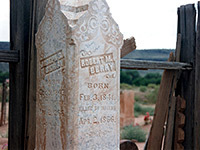 The Berry memorial is the largest, at the center of the graveyard, and is enclosed by a wooden fence for added protection. Several Native Americans are also buried here. Past the cemetery, the road turns due north, and ends at a parking area 350 feet from the Virgin River. The town once extended nearly half a mile west, but none of the buildings in this section remain, and most of the land is privately owned; instead, the five surviving structures are close to the road - two on the west side, three to the east. The first building is a barn, with outhouse, followed by the John Wood home (built in 1877), shielded from the road by several ancient cottonwood trees. To the east, the largest building is a combined church/schoolhouse dating from 1886, while close by is the Alonzo Russell home, a two-story dwelling with an elegant veranda at the front. The fifth building, the Louisa Russell home, is right opposite, and both adjoin farmland containing several dozen pieces of faming equipment and machinery.